Rajasthan is not only famous for its pristine palaces, forts and havelis, but is also well known for its well conserved wilf life. Whether you are an avid birdwatcher or love to go on a safari ride around the jungle, Rajasthan is the place for you. Bharatpur is one of the many places in Rajasthan that is celebrated for its rich diversity in wild life. Among these is the Keoladeo Ghana National Park, which is a UNESCO deemed world heritage site since 1985. But it’s not only the National park that Bharatpur is famous for, whilst here you can visit the Laxman Mandir, Ganga Mandir, The Deeg Fort and the Lohagarh Fort. The Keoladeo National Park is one of its kinds in the country. Housing more than 350 species of birds and over 35 species of exotic butterflies, the Keoladeo National Park is truly a bird watchers paradise. Spread over an area of 29 square kms, the park is quite extensive offering its inhabitants a safe haven to breed and live without external infiltration. The national park is a proud host to storks, spoon bills, white ibis, herons, ducks, cranes, flamingos, eagles, kingfishers, and vultures. Apart from these, one can also see flying fox, porcupine, sambar, mongoose, red faced monkeys, hyena, and jackal. Many birds from Europe and Central Asia frequently make the park their home during the breeding seasons. This elegant and beautiful temple is dedicated to Laxman, the brother of Lord Ram. The temple is famous for its ornate carvings on stone and intricate interiors. The Deeg Fort was constructed in the early 18th century and served as the capitals of the Jat Rulers throughout that period. 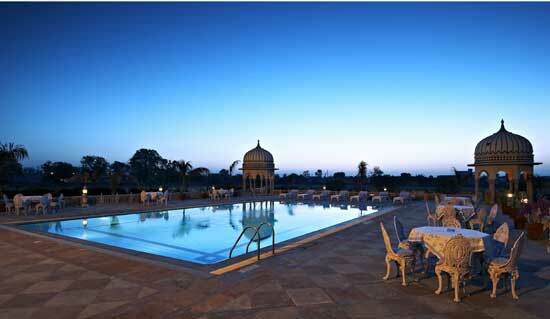 Built by Maharaja Suraj Mal, the Deeg Fort represents power, might and beauty in the Jat rule of Bharatpur. The Fort is known to house several Bhawans, or palaces namely the Suraj Bhawan, the Gopal Bhawan, Nand Bhawan, Kisan Bhawan, Purana Mahal and Seesh Mahal. These are collectively known as the Deeg Palace. The Fort has 10 gateways and 72 citadels, it also houses 12 massive towers, which also includes the Lakha Burj, which is the largest one. Built in 1845 by Maharaja Balwant Singh, the Ganga Mandir, is a beautiful structure that attracts tourists and pilgrimage all year round. During the construction of the temple each employee of the state was asked to donate one month’s salary to the construction of the temple. Hence the construction of the temple was literally a state affair, making this structure extremely close to every local’s heart. Built by Maharaja Suraj Mal, the Lohagarh fort literally means the fort mane of Iron. This iron fort is one of the strongest forts in the country and this was put to test in 1805, when the British attached the premises, only to lose and retreat. It is said that during its construction Maharaja Suraj Mal made tremendous efforts to see to it that the fort was architecturally strong and could withstand attacks in the future. The fort also houses a few significant monuments like the Mahal Khas, Kishori Mahal, Moti Mahal, Jawahar Burj and Fateh Burj, which are also a must visit.